From the outside, the place looks like a dive. However, on the inside, it is tastefully decorated and modern. I wasn't expecting that... The nice ladies that run the place are constantly working like bees churning out food and serving it. I'm not sure how they handle it when the place gets full. Anyways, I came to try the pho and I ordered a large bowl. I added a Stir-Fried Spicy Chicken for good measure. When the bowl of pho arrived, it certainly looked different from what you'd expect. The broth was extremely light in colour and instead of beef, there was imitation meat. 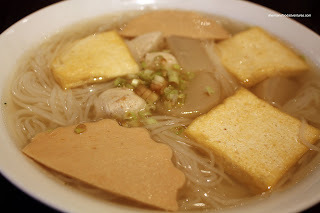 I quickly tried the broth and it was sweet a nd fragrant (from the lemongrass). It surely lacked the depth of a traditional beef broth. However, it wasn't bad. The noodles were cooked perfectly and the "meat" was something you'd see at Bo Kong. 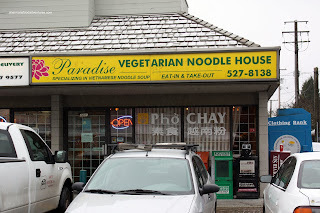 Wasn't anything mind-shattering or life-altering; yet it was an enjoyable bowl of vegetarian noodles. Naturally, I like the real thing better; yet, I didn't dislike this one either. While the pho was light in flavour, the Spicy Chicken was a kick in the pants. As you can see for yourself, it was stir-fried with peppers and chili flakes. 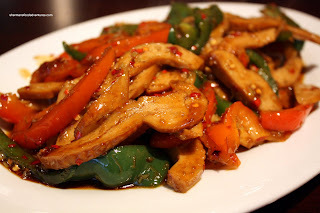 Savory, sweet and spicy, this dish would be classified as "make you forget about meat". With the "chicken" being made with gluten, it was chewy and provided a nice texture. This would've went well with rice. So, during my meal here, I disclosed why I was taking pictures (they asked me why). Seeing this, the nice lady insisted on giving me 50% off. I pleaded for her not to do that to no avail. So just FYI that I paid only half. I remember going in there a few years ago to grab a take-out menu. Much head-scratching ensued. It says vegetarian but then the menu says beef, chicken, etc. If you're vegetarian don't you want it called tempeh and tofu? I guess the only thing that matters is how it tastes. Thanks for shedding light on the place! Exactly Karl, a friend of mine went in there and ordered "chicken" and was surprised as to what he got. We all assume it's vegetarian, but the menu states otherwise. Had a similar experience. 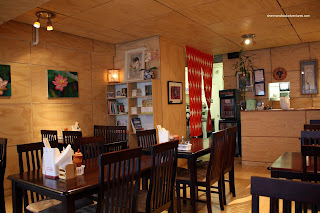 Nice little place, doing something different when it comes to pho.